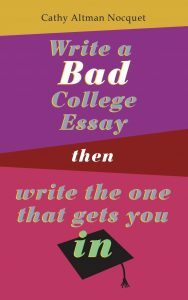 Come in for some essay help with writer Cathy Altman Nocquet. Platitudinous droning, however polished, will not get you into the college of your choice. University admissions officers want to know who you are and how you think, not read your affirmation that “music is the universal language.” Finding your own voice and unique content for your essay will not only help your application rise to the top, it will improve your writing overall. Join writing coach and author Cathy Altman Nocquet for insights and writing exercises that will help you craft a strong essay in your unique voice. Cathy Altman Nocquet graduated from Columbia University and made a career of creative thinking while working in international advertising as a writer and strategist. Her workshops feature original exercises designed to conquer writer’s block and facilitate written expression. She has worked with students from dozens of schools in the US and Europe, led workshops at libraries and for the English Language Schools Association as well as other non-profit educational groups. Cathy will teach at the New York Times Summer High School Academy this year. Her work has been shortlisted and nominated for Editorial Prizes in national and international writing competitions. 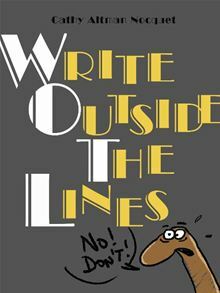 She is the author of Write Outside the Lines: A Creativity Catapult and Write a Bad College Essay, Then Write the One That Gets You In. Registration is required for this workshop. Click HERE to register. Email Celeste, the children’s and teens’ services manager with questions about our programs and collections for teens: celeste@americanlibraryinparis.org or call the Library at 01 53 59 12 69. Participation in this workshop is free for Library members and 10€ per session for non-members. Learn more about Library membership options.